See the best sights in New Zealand and feel as if you have visited six different continents in three weeks. From tropical rainforests and idyllic beaches, to glaciers and snowy peaks. You will see Saharan-like sand dunes, volcanoes and primeval fiords along the way. Ride through roadscapes that most motorcyclists only dream of, take on East Cape, Milford Road, Lewis & Lindis Passes. There is a reason Haast Pass is called ‘Motorcycle Heaven’, most cameras can’t capture its beauty, and the road is incredible to ride! If you like to do things properly and don’t want to miss out on anything that New Zealand has to offer, then this is the motorcycle tour for you. motorway we’ll ride into the country, your first taste of winding New Zealand roads and no traffic. We’ll stop at Dargaville for lunch, and then onward through the Waipoua Forest and a visit to Tane Mahuta, a 2,000 year old sacred Kauri Tree. Tasman seas. Retracing our steps we then ride to our overnight stop at Taipa Beach. Taipa Beach to Paihia 120km: We'll get to Paihia today through beautiful farm land and re-crossing the Hokianga Harbour. All the beauty of the Bay of Islands awaits us. Islands on Dolphin Seeker, a purpose built dolphin and whale watching catamaran. Keep a look out for common and bottlenose dolphins, whales and other marine life. Paihia to Auckland 260km: Crossing on the Opua vehicle ferry to Russell, we ride South through lovely twisty roads and then pass through Whangarei before crossing the Brynderwyn Hills and heading to Matakana for lunch. Riding onward through the Dome valley we’ll arrive in Auckland, the 'City of Sails'. Auckland to Whitianga 187km: We head south out of the city before crossing the Hauraki Plains and discovering the Coromandel Peninsula. An area of outstanding natural beauty with fantastic roads. Stay overnight in the beautiful sea side village of Whitianga and have dinner overlooking the marina. Whanganui to Rotorua 232km: Ride the circuit around the Coromandel Peninsula - see bush clad hills and enjoy stunning views of the coastline. On the way to Rotorua, we are on one of the most scenic rides in the North Island. Rotorua is the geothermal hotspot of New Zealand – geysers, boiling mud and volcanic craters and a proud Maori population. populated areas in New Zealand, the East Cape. After passing through Whakatane we ride the coast road with a view of White Island, an active volcano, on the horizon to our left. The road hugs the coastline giving us stunning seascapes. We overnight in Hicks Bay. for lunch. We then ride slightly inland through twisty and undulating roads, before we reach vineyards and fruit orchards as we arrive in Hawkes Bay. road…….. After coffee at Taihape we continue inland until we get to State Highway 4, which is just a gorgeous ride that ends alongside the river and Whanganui. Harbour. Explore the capital city and see the 'Beehive' - New Zealand's government building and visit the fabulous Te Papa Museum. Wellington to Nelson 133km: Cross Cook Strait by ferry, and ride the Marlborough Sounds' iconic road - Queen Charlotte Drive. Follow the road through dense pine forests to Nelson, Australasia's largest fishing port, with its unique microclimate. Nelson has the highest number of sunshine hours in the country and is known for its art and culture. Nelson to Hanmer Springs 310km: Ride south over Mt Hope Saddle and through the Buller Gorge. Stop for lunch at the old gold mining town of Murchison then ride the famous Lewis Pass with its world-class mountain scenery. Hanmer Springs, set in a basin of forest clad mountains and home of natural hot springs where you can soak away your aches. cooked crayfish on the sea shore at Kaikoura. were 30 million years in the making. on the West Coast Road. A curvy route through the wild and rocky west coast leading to beautiful native forests and lakes. The West Coast road looks towards the Tasman Sea on the right and Southern Alps on the left. Nowhere else in the world at this latitude have glaciers advanced so close to the coast. These majestic, awe inspiring spectacles are amazing seen from the ground and even more stunning seen from above. A helicopter trip can take you around Mount Cook and land on the glacier - a trip you'll never forget. snow-capped mountains and cross the highest sealed road in New Zealand, the Crown Ranges and descend into the Adventure Capital of the World - Queenstown! old Gold mining town of Arrowtown or the fabulous road to Glenorchy alongside Lake Wakatipu. Have lunch at the Gibbston Valley winery, just down the road from the A J Hacket Bridge Bungee. Eat at The Skyline restaurant at the top of Bob’s Peak – you can look over Queenstown and watch the sun set over the mountains. A second 'Rest or Ride' day in Queenstown, because just one is never enough! enclosing them, dolphins, seals and Fiordland crested penguins make their home here. This is where the word 'silence' takes on a different meaning. Another great trip is the Te Anau glow worm caves, accessible by boat, if you wish. famous Homer tunnel – carved out of the rock by hand in the 1930s. Emerge the other side of the tunnel to stunning mountain scenery and twisting roads. Keep an eye out for the cheeky, very intelligent Kea Alpine parrots. Milford Sound cruise (included on your tour) cruise is 2 hours. 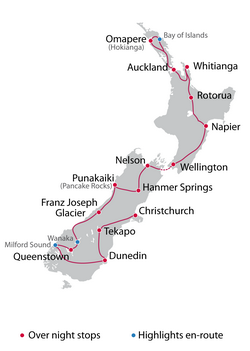 Te Anau to Invercargill 158km: We head to Manapouri, and then inland and onto the Southern Scenic Route. Mainly deserted roads lead us to the tiny town of Tuatapere for a welcome drink and sweet treat. From here we ride briefly beside the sea, our first view of the Southern Ocean, not much between here and Antarctica. We arrive in Invercargill to see the Burt Munro collection, Motorcycle Mecca and transport World. mountain. At the Church of the Good Shepherd, admire the bronze statue of a sheep dog, and views of the turquoise lake. Ride on to Christchurch via Burke’s Pass, Mount Hutt and the Canterbury Plains. Tonight we’ll celebrate our tour in the unique Paradise way…………..